We ended 2017 with a much anticipated Toon Lunch Club in the oldest dining room in the UK. 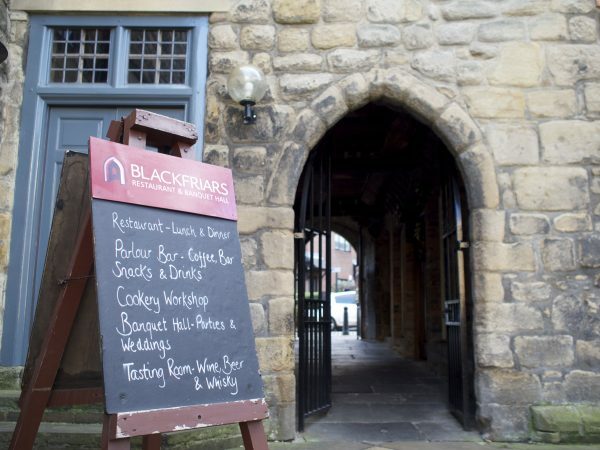 Dating back to 1239, Blackfriars is the former refectory of a friary where the monks used to tuck into their bowls of vegetable pottage (stew). We were hoping for something a little more elaborate when we visited on New Years Eve for our last TLC of the year. Throughout December Blackfriars was exclusively serving food from their Christmas menu, which featured an array of festive classics with a couple of other options thrown in. We pulled our complimentary crackers and nibbled on the rye sourdough bread which was brought to our table by one of the friendly waiters who served us. As they make their own bread and run bread-making workshops in their new purpose-built cookery school upstairs, you’d expect the bread to be good – which it was. A great start to proceedings. As I’m pregnant and the Mr was driving we ordered a couple of soft drinks and browsed the menu. The starters featured retro classics such as prawn cocktail, game terrine and smoked salmon, but we fancied something different so I went for homemade black pudding with crispy onions and brown sauce and the Mr wanted to go for Scottish scallops, cauliflower purée and crispy bacon but was told that with it being the last day of the festive menu they were out of scallops. He went for the classic prawn cocktail instead. 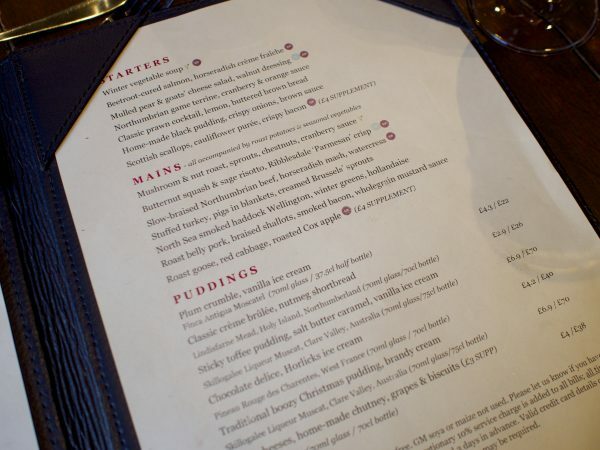 The festive menu was £28 for a 3 course lunch, which is £10 more than their standard set lunch menu. 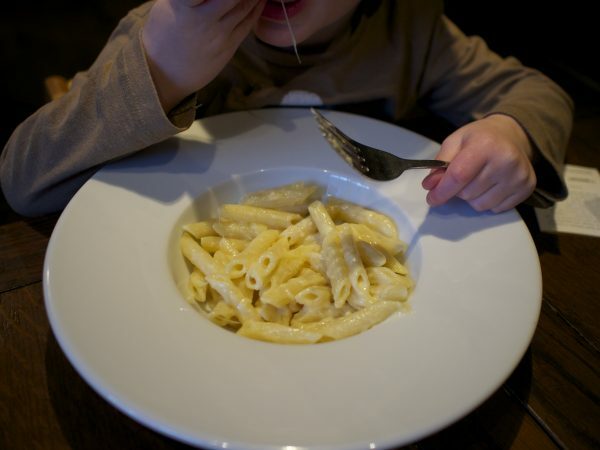 Kids can have half portions of the main courses or fish/chicken and chips, sausage and mash or cheesy tomato pasta (£6 each or £9 including cordial & a scoop of ice cream). LD settled on fish and chips while I went for North Sea smoked haddock wellington, winter greens and hollandaise and the Mr chose roast goose, red cabbage and roasted Cox apple (£4 supplement). 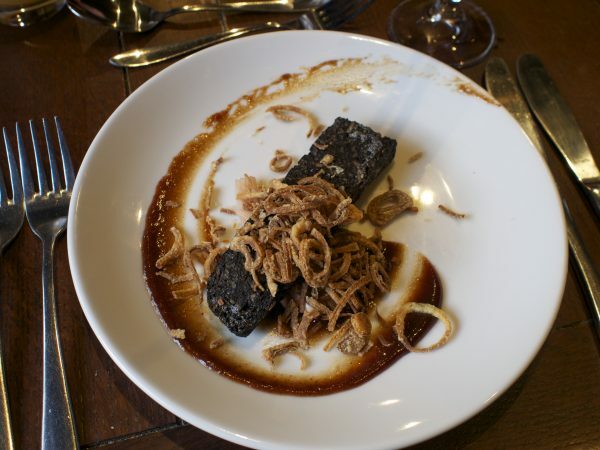 The starters were served promptly and my homemade black pudding was well seasoned and really flavoursome, with both fried and pickled onions adding interest to an otherwise simple dish. 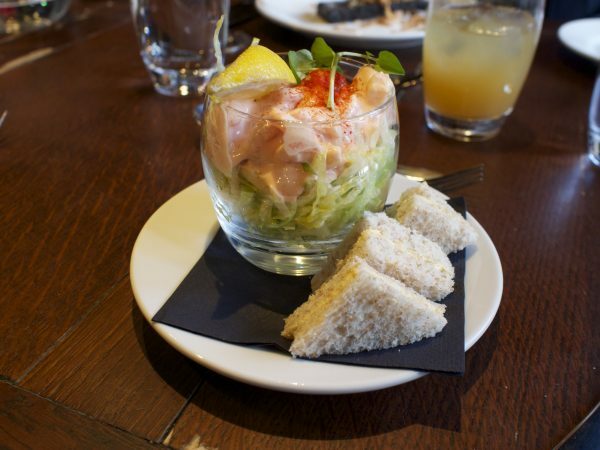 The Mr’s prawn cocktail was simply a good version of the classic, with the obligatory shredded iceberg and not a lot else. We were then told that fish and chips weren’t available, which was a bit tricky to convey to three year old with his heart set on it. Luckily he was persuaded to have some cheesy pasta instead. Our mains arrived looking great and we were excited to tuck in. Both came with roast potatoes, assorted veg and Yorkshire puddings much like (I presume) their Sunday lunch. 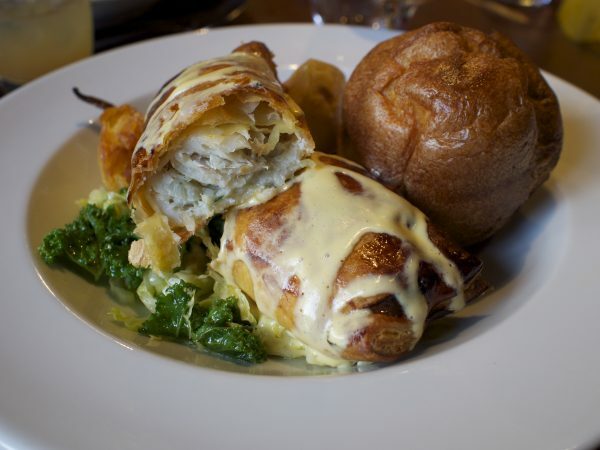 My smoked haddock wellington reminded me of salmon en croute much more so than wellington. It was basically a piece of smoked fish covered in puff pastry and drizzled with a creamy sauce. It was nice if a little dry, and more of the sauce would’ve been welcome. The veg was good but the greens would’ve benefitted from a touch of garlic or some fennel seeds, or something to elevate them and inject a bit more flavour. When you’re not covering everything with gravy the individual components need to fend for themselves and this was just missing a little something. The Mr found his goose to be a bit on the tough side and felt it could’ve benefitted from a slower cook, he felt it tasted pan fried. He enjoyed his accompaniments, especially the red cabbage but found the Yorkshires to be a little dense. 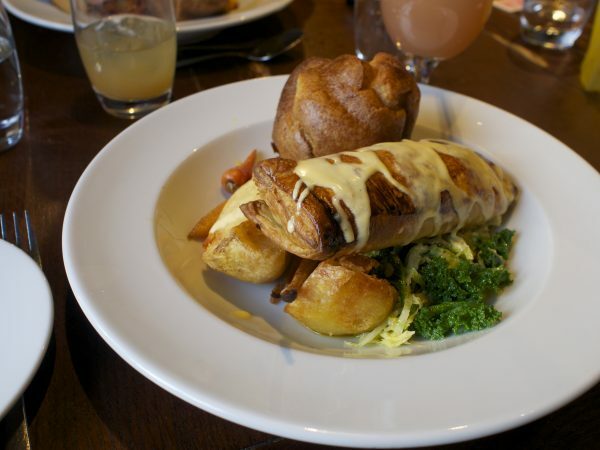 I disagreed, enjoying them immensely – everyone has their opinion when it comes to Yorkshires! LD polished off his cheesy pasta in no time, clearly happy with his second choice. 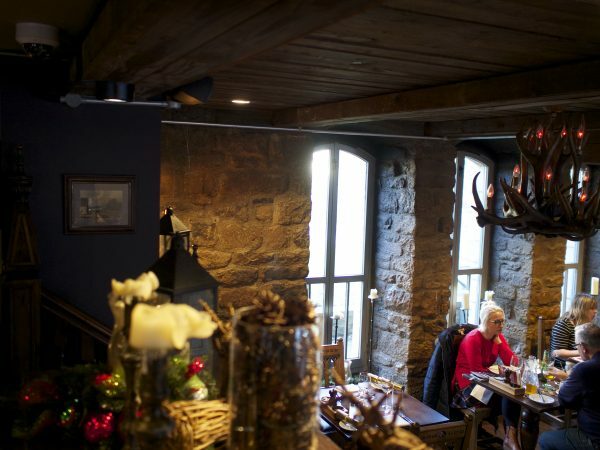 I had a look around the cosy restaurant and rooms upstairs. They hold various events in their new tasting room and cookery school including cheese and wine matching, chocolate making and seafood and fish cookery lessons. I’ve been to one of their medieval banquets in the hall next door, which was good fun and it’s great to see a venue thinking outside the box and utilising their space. Click here to view the list of what’s on this year: Events 2018. For dessert there were no lactose free options on the menu for the Mr but they were happy to adapt one and offer a plum crumble with sorbet instead of vanilla ice cream. 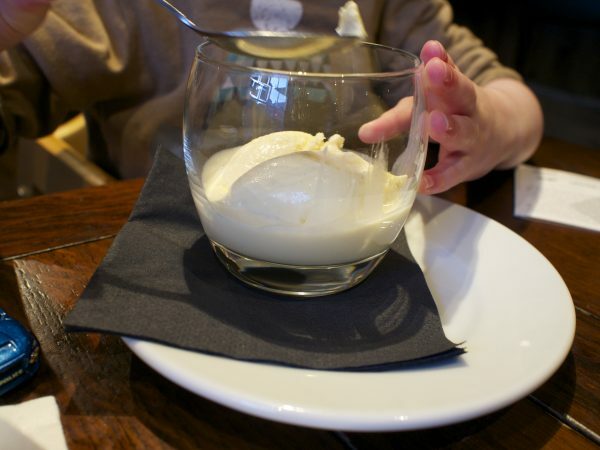 I went for an old favourite; classic crème brûlée with nutmeg shortbread and LD asked for his favourite: ‘white’ ice cream. 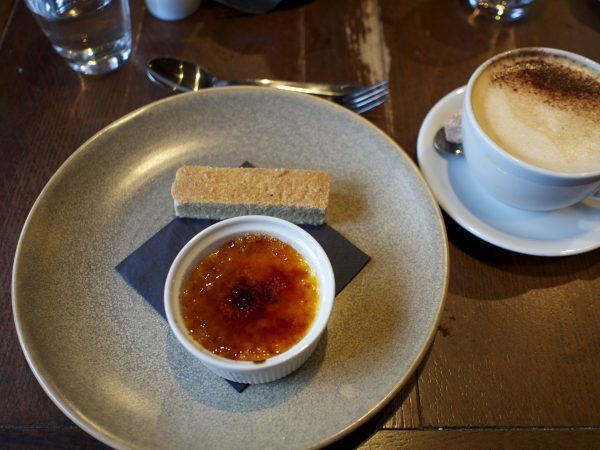 My crème brulee was delicious and I polished off the lot. Perhaps not quite as good as Café 21 but certainly up there; with creamy, vanilla flavoured custard coated in a thick, crisp layer of burnt caramel. The homemade shortbread was a good accompaniment, great for dunking in. 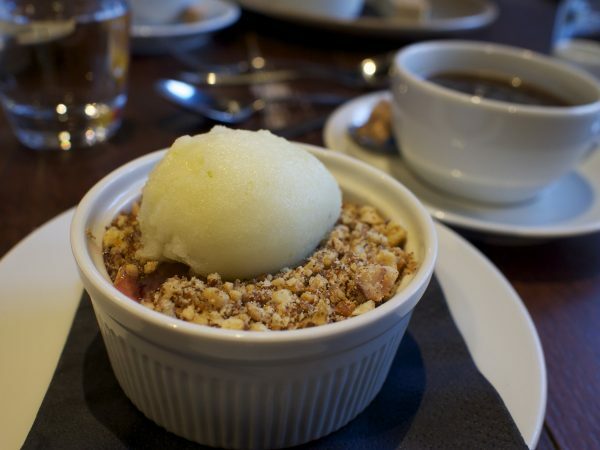 The Mr found his crumble a little tart, but otherwise pleasant and LD gave his vanilla ice cream a big thumbs up. 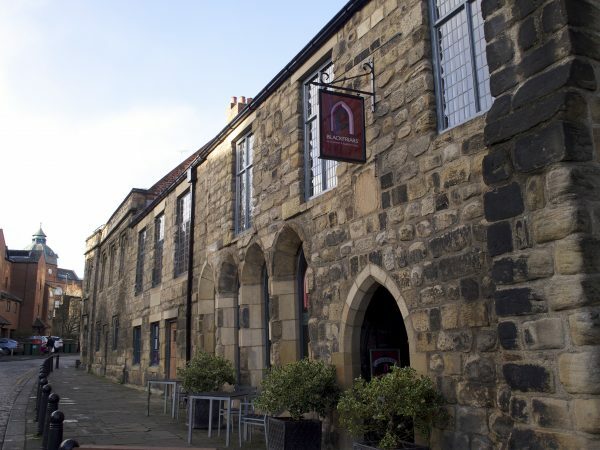 Blackfriars is a Newcastle institution and a must-visit for many. 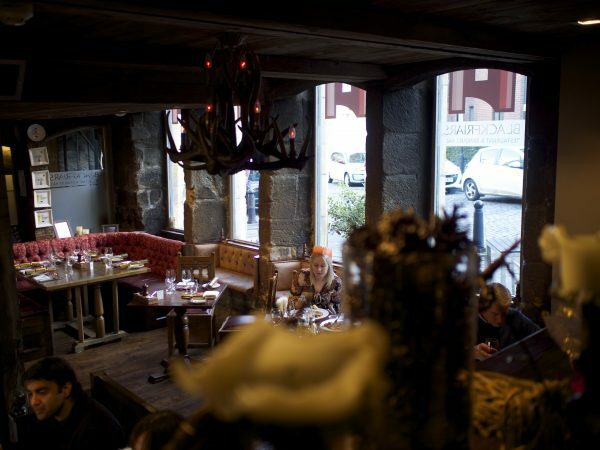 Their sister restaurant Dobson and Parnell on the quayside got 5/5 from us for their inventive use of flavours and ingredients. We were expecting Blackfriars to delight us on a similar level, but it just wasn’t up to D&P standards, which is a pity. 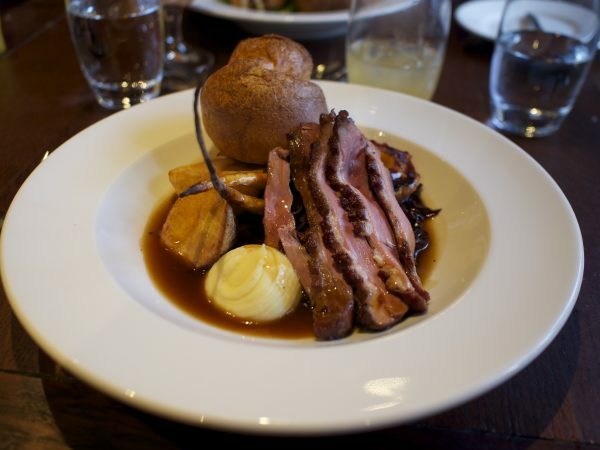 A few tweaks and things could be amazing, it just felt like creativity in the kitchen wasn’t 100%, and though perfectly pleasant it didn’t have the ‘wow’ factor a place like Blackfriars ought to have.